In the March 6th issue of Nucleic Acids Research, Lisa Muniz, Sylvain Egloff and Tamás Kiss published an extensive analysis of protein RNA interactions involved in assembly of the 7SK snRNP(1). La binds to the 3’ end of essentially all Pol III transcripts, but for the 7SK snRNA La is eventually replaced by Larp7. 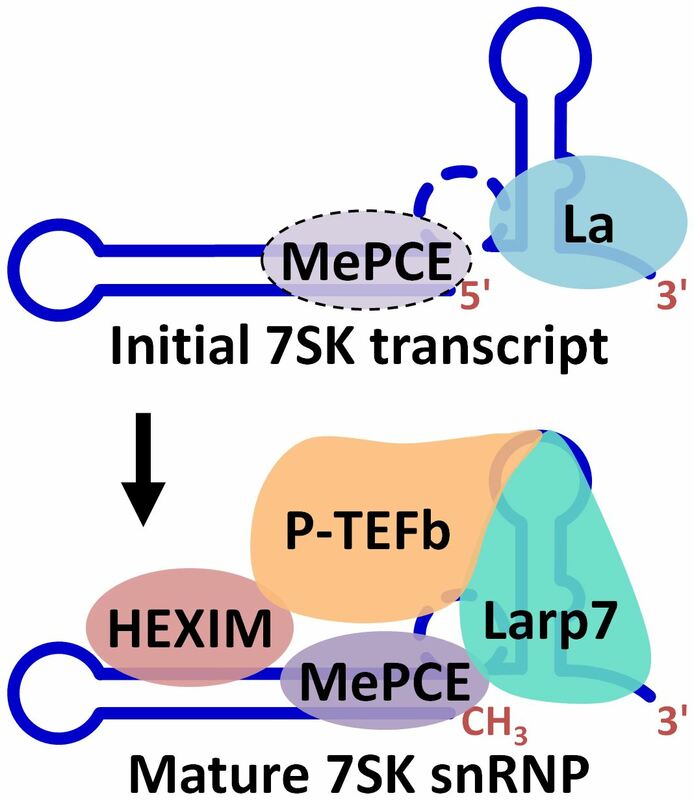 The Kiss group showed that when La is bound to 7SK it does not recruit HEXIM1/2 or P-TEFb (see Figure), but some association with MePCE was found. They hypothesized that methylation of 7SK might facilitate the exchange of La by Larp7. They previously reported that the 3’ hairpin in 7SK was required for association of P-TEFb and here they dissected the interactions with a large number of 7SK mutants in cells and concluded that Larp7 binds to the structured stem and two residues in the loop, as well as the U-rich tail. Association of P-TEFb required the presence of Larp7. Larp7 also promoted the stable association of MePCE. This study significantly improved our understanding of the dynamics of protein association with 7SK snRNA. Future studies will need to address the function of the 7SK snRNP in regulating Pol II transcription through control of P-TEFb activity. A link to the manuscript: Muniz, L., Egloff, S. and Kiss, T. (2013) RNA elements directing in vivo assembly of the 7SK/MePCE/Larp7 transcriptional regulatory snRNP. Nucleic acids research, PMID: 23471002. Figure. Exchange of Larp7 for La during assembly of the 7SK snRNP. The diagram depicts the interactions of the indicated proteins with 7SK snRNA during the production of the mature 7SK snRNP. 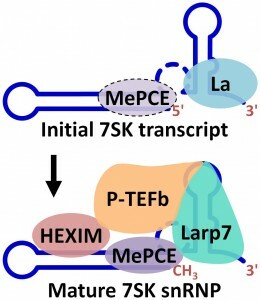 La, La protein; MePCE, methyl phosphate capping enzyme; HEXIM, HEXIM1 or HEXIM2; P-TEFb, positive transcription elongation factor b; Larp7, La related protein 7.